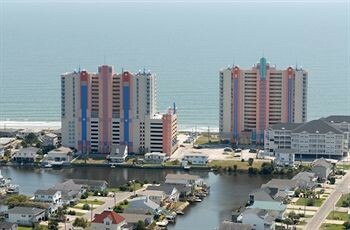 Property Location Located in North Myrtle Beach, Prince Resort is by the ocean, minutes from Cherry Grove Pier, and close to Surf Golf and Beach Club. This beach aparthotel is within close proximity of Tidewater Golf Club and Molten Mountain.Rooms Make yourself at home in one of the 257 air-conditioned rooms featuring kitchens with full-sized refrigerators/freezers and stovetops. Rooms have private furnished balconies. Wired and wireless Internet access is complimentary, while DVD players and cable programming provide entertainment. Private bathrooms with shower/tub combinations feature deep soaking bathtubs and complimentary toiletries.Rec, Spa, Premium Amenities Dip into one of the 2 outdoor swimming pools or 3 spa tubs and enjoy other recreational amenities, which include a lazy river. This aparthotel also features complimentary wireless Internet access, concierge services, and supervised childcare/activities.Dining Satisfy your appetite at the aparthotel&apos;s restaurant, which features a bar. Dining is also available at a coffee shop/café. Relax with your favorite drink at a bar/lounge or a beach bar. Buffet breakfasts are available daily for a fee.Business, Other Amenities Featured amenities include a business center, complimentary newspapers in the lobby, and a 24-hour front desk. Event facilities at this aparthotel consist of a conference center, conference space, and meeting rooms. Free self parking is available onsite.